Changamka runs a mobile money transfer technology. This system allows users to transfer money via M-Pesa to a prepaid smart card. The prepaid electronic smart card, known as Changamka, enables the bearer to save and receive outpatient primary health care treatment at a pre-contracted price. 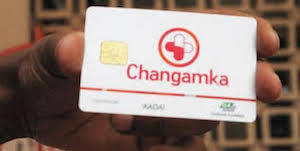 Through this technology, mothers in low-income areas who have no access to medical schemes and insurance can save money on the Changamka Smart Card.They can then use the account to pay hospital fees upon their delivery, reducing the number of maternity deaths due to lack of health care. Changamka Smart Cards can currently be purchased at 19 locations in Kenya. Users can now also use M-Pesa to save up for Linda Jamii, a recently launched health insurance family plan costing $140 (US) per year.